Congratulations to our lucky winner @BrolyGrantner for winning the Momodora #NintendoSwitch giveaway! Thank you everyone and @Dangen_Ent for sponsoring! Please stay tuned for our next giveaway. Hey everyone! Welcome to NintendoSoup’s 40th giveaway. This week, we’re giving away a copy of Momodora: Reverie Under The Moonlight for Nintendo Switch, thanks to the folks at Dangen Entertainment. There are two ways to enter the contest – follow the instructions on Facebook and/or Twitter. 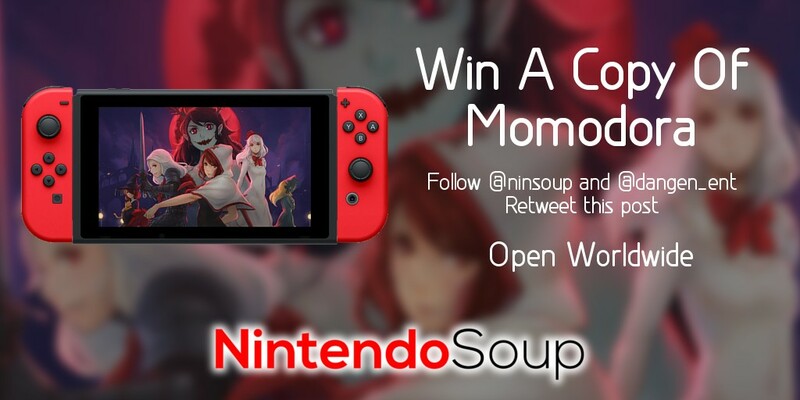 Win a copy of #Momodora for #NintendoSwitch! Open worldwide, ends February 18 6am PT. Giveaway ends February 18, 2019 6:00am Pacific Time. 1 winner will be randomly chosen. Open to everyone worldwide.